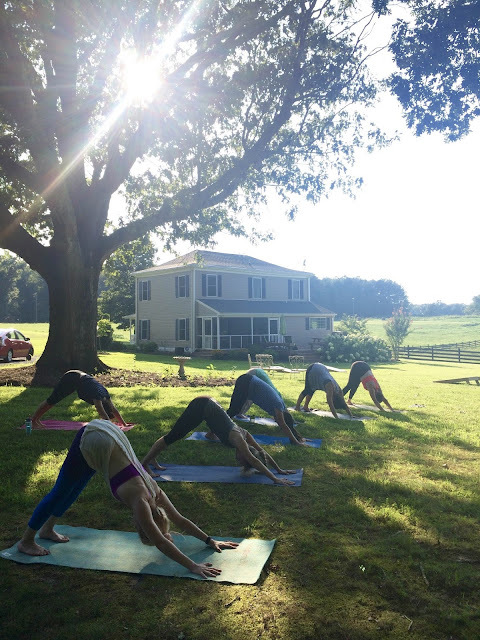 I've been meaning to write a recap of last weekend's wellness retreat. Indeed, I was left feeling refreshed, hopeful, and inspired. The schedule included a tour of the land, mindfulness lessons, farm to table meals, and yoga. We had a wonderful crew of like minded women who were kind and actually interested in learning about one another. My friend and her cousin (who ran the show) could not have been better hosts. In fact, it all went so well that they've already lined up the next retreat weekend which will be on October 15th-16th. Feel free to leave a message here or contact Lucie directly - luciehouse(at)gmail(dot)com - to sign up. You will be glad you did! I'll leave you with this Rumi quote that we read. I have it up on my fridge as a reminder to let go and soften.